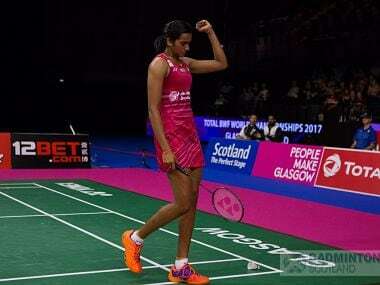 Tokyo: Newly-crowned Korea Open champion PV Sindhu dished out another splendid performance edging past Japan's Minatsu Mitani for the second time in as many weeks to reach the second round of the women's singles at the Japan Open Super Series at Tokyo on Wednesday. Returning to action after a week's break, Saina Nehwal and Kidambi Srikanth also made positive starts to their campaign, notching up contrasting wins in women's and men's singles. Fresh from a sensational week at Korea, Olympic silver medallist Sindhu continued her good run as she recovered from a game down to edge past Mitani 12-21, 21-15, 21-17 in the opening round. The Indian had also beaten Mitani in three games at the Korea Open quarterfinals. The 22-year-old World No 4, who had won a maiden silver at the World Championship last month, thus set up a second round face off with World Champion Nozomi Okuhara for the third time in last three tournaments. The duo had battled for an hour and 50 minutes at the finals of Glasgow World Championship, before fighting it out for 83 minutes at Korea Open final last Sunday. Saina, who bagged a bronze medal at World Championship, had skipped the Korea Open due to a slight thigh strain. She took 39 minutes to dispatch Thailand's Pornpawee Chochuwong 21-17, 21-9 in the women's singles opening round. London Olympics bronze medallist Saina will take on reigning Olympic champion Carolina Marin in the next round. Saina has a 4-3 record against the Spaniard, having lost thrice in the last four meetings. Srikanth, who had won titles at Indonesia and Australia, also produced superlative performance to overcome China's Tian Houwei 21-15, 12-21, 21-11 to improve his 1-6 record against the World No 10. "The conditions were good here. It was a tough match and was a close one. I always wanted to stay focused and it worked well for me today," Srikanth, who had reached the quarterfinals at Rio Olympics, told PTI. The eighth seeded Indian, who had reached the finals at Singapore Open, will face Hong Kong's Hu Yun next. The World No 8 Indian has a 2-2 head-to-head count against Yun, having lost twice in 2015. US Open Grand Prix Gold Champion HS Prannoy and Syed Modi Grand Prix Gold winner Sameer Verma also advanced to the second round with straight-game wins over their respective opponents in men's singles here. While Prannoy got the better off Denmark's Anders Antonsen 21-12, 21-14, Sameer took 40 minutes to subdue Thailand's Khosit Phetpradab 21-12, 21-19 in another match. Prannoy will now take on the winner of the match between Chinese Taipei's Hsu Jen Hao and Hong Kong's Ng Ka Long Angus, seeded sixth. Sameer, on the other hand, will square off against either France's Brice Leverdez or second seed Chinese Shi Yuqi in the next round. Sameer's elder brother, Sourabh, however had to bow out of the tournament after his fight against seventh seed and two-time Olympic gold medallist Lin Dan of China ended with a 21-11, 15-21, 13-21 loss. Singapore Open champion B Sai Praneeth also found it going tough as he went down fighting to Lee Dong Keun of Korea 23-21, 17-21, 14-21 in a thrilling contest. 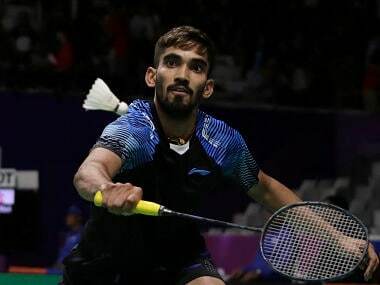 Fast-rising doubles player Satwiksairaj Rankireddy also advanced to the mixed doubles second round alongwith experienced Ashwini Ponnappa after defeating Thai pair of Tinn Isriyanet and Pacharapun Chochuwong 21-17, 21-13. However, Satwik and his men's doubles partner Chirag Shetty couldn't get across third seeds Marcus Fernaldi Gideon and Kevin Sanjaya Sukamuljo of Indonesia, going down 25-27, 15 -21 in another pulsating contest. Experienced men's doubles pair of Manu Attri and B Sumeeth Reddy also crashed out after losing 18-21 15-21 to eighth seeds Lee Jhe-Huei and Lee Yang of Chinese Taipei, while third seeded Korean Chang Ye Na and Lee So Hee ended Ashwini and N Sikki Reddy's stay with a 21-17, 21-12 win in women's doubles event.